He bought a teapot. In 1866. At the auction to settle his former master’s debts. 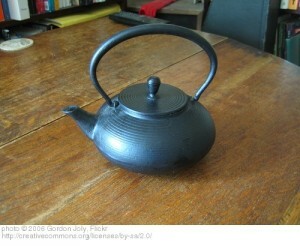 Berthier bought a teapot. That’s all I know of the facts. Yet, it is enough. Enough to craft a story. Enough to frame a character, to see him standing tall and proud in a suit bought for just this occasion. To see him lean against the oak tree that I run past on foggy mornings. To watch him walk up and pay on the front steps made of sandstone that his uncles helped quarry. Enough. This is the thing – writing is all about story. Actually, everything is all about story. The stories that help us understand. The stories that we tell ourselves. The stories whispered to us in the bright shine of a winter night. The stories passed in notebooks and photo albums. Stories that come in teapots and snapshots. Stories. So Berthier’s story starts with a teapot and opens to a life. Yep, that’s why I do this writing thing. What’s one object in your life or the life of your subject/character that is important? What stories does it open up?